Organisers of the RAF Cosford Air Show today announced that the 2015 event, to be held on Sunday 14th June, would be an advance ticket only event. The change in policy comes as part of an effort to improve traffic flow and access to the site. The RAF Cosford Air Show is the largest aviation event in the West Midlands but is also renowned for the huge variety of attractions on the ground with something for all the family. Other attractions that visitors to the show can enjoy include the children’s inflatables, simulator rides, aviation exhibitors and military grounds displays. There are also plenty of shopping options for all the family, various catering facilities and of course the RAF Museum. 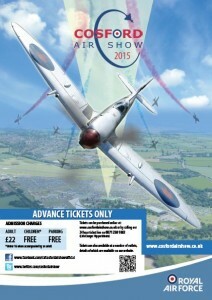 In the last two years alone, the air show has raised over £500,000 which has been donated to local and RAF charities.